This is the first in a series of articles about aquatic insects. By way of introduction, an extinct relative of the modern-day mayfly was first detected in 250 million year old rocks. Today, 30,000 aquatic insect species representing 12 insect orders have been named. There are even aquatic members of the butterfly and moth order. Picking a favorite to discuss is impossible, so we’ll start with one of the more weird aquatic bugs. The giant water bug belongs to the Order Hemiptera, or “True Bugs.” Looking at this insect can leave no doubt that it is a predator. The largest can grow up to 40mm or 1.5″ long. Our common giant water bug is about 20mm or 3/4″ long. Their large eyes and grasping forelegs are excellent at finding and catching other aquatic creatures. 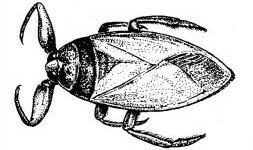 Once caught, the giant water bug injects its prey with a chemical that digests protein, which is then sucked up like a protein shake. Giant water bugs are helpful to creeks and ponds because they feed on non-native, warm water fish fry and bullfrog tadpoles, although they will eat anything they can catch. The most unusual behavior of these bugs is that the male cares for the young. He will allow only females that he has mated with to lay their eggs on his back, ensuring that he is caring for his own progeny. As the eggs incubate, the male will bring them to the surface or do “push ups” to aerate them. As the nymphs develp inside the eggs they get heavy enough to drown their parent. He must get his own oxygen supply as well as provide air to his offspring, so a smart daddy bug will hang around submerged vegetation that he can use to climb to the surface. Isn’t that remarkable?